Hopefully a simple question. I was wondering about where E line (Lechmere - Heath St.) cars were stored when not in service. C line Reservoir I believe. D line Riverside and maybe Reservoir? However E line has no yard along it (now that it has been truncated from Arborway to Heath St.) so where are cars stored? I guess some could be stored at Lechmere and some in the Heath St. loop, but is that enough space for all cars, or do they have to deadhead from another yard? Lechmere yard holds a few trains. 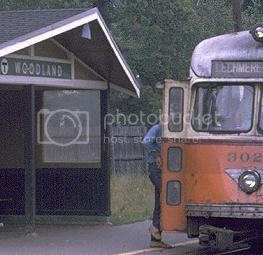 Also, several early-morning runs from other lines run through to Lechmere and then become E Heath Street trains. If you look at the official schedule you’ll see a footnote that reads something to this effect also. We store Huntington Avenue trains at Lechmere overnight. The yard tracks are filled first, after rush hour, and then the inner loop, and finally the outer loop. The terminal can hold 10 two-car trains. They get them from Reservoir, often times stored on the upper yard ladder track. You can use Google Maps and see there are 7 scheduled pullbacks to Reservoir every afternoon, at 6:45, 7:06, 7:25, 7:42, 7:58, 8:07 and 9:22. There's also one in the mornings scheduled for 9:20. Depending on equipment needs, the state of the ladder track and other considerations, they are sometimes dropped or sent out the Beacon line (or more rarely to Riverside). They were at one time stored in the Brattle Loop but graffiti and the desire to have the loop open forced the T to keep them at Reservoir. These ladder track pullouts supplement the trains stored at Lechmere. No trains are stored at Heath Street, the last train to the loop (12:30am from Lechmere) returns empty to Lechmere. It should be noted that Reservoir stores cars for all lines (except Riverside). Neither Lake St. nor Lechmere is large enough to store all the equipment needed on their lines. Actually, I'm fairly certain more cars are sent from Reservoir to Comm. Ave. than to Huntington. bozepravde15 wrote: They get them from Reservoir, often times stored on the upper yard ladder track. You can use Google Maps and see there are 7 scheduled pullbacks to Reservoir every afternoon, at 6:45, 7:06, 7:25, 7:42, 7:58, 8:07 and 9:22. There's also one in the mornings scheduled for 9:20. Depending on equipment needs, the state of the ladder track and other considerations, they are sometimes dropped or sent out the Beacon line (or more rarely to Riverside). They were at one time stored in the Brattle Loop but graffiti and the desire to have the loop open forced the T to keep them at Reservoir. These ladder track pullouts supplement the trains stored at Lechmere. No trains are stored at Heath Street, the last train to the loop (12:30am from Lechmere) returns empty to Lechmere. Correct, those would be either RAD's with a primary assignment on the Huntington Avenue line or scheduled trips. 10 deuces can't handle the ridership anymore. In a similar way, we ran 842's on weekdays and Saturdays, but at OCC they'd be the first cars we'd re-route to fill a gap on another line, frequently on Commonwealth Avenue. That 12:30am trip from Lechmere has no departure time from Heath Street. It runs light to Lechmere because the east/west connections have been made by the time it reaches the Central Subway, and Inspectors are in the process of locking the stations.